It is a past now available in abundance (all those online archives) but it is its mysteries that pile up, refusing to add up. And even when we are not searching with conscious intent, the mystery somehow drifts into view to filter and refract our new images as never before. Photography, mute and immobile, was once the great consort of progress, the messenger bringing ever-newer news of things and events great and small. Today you could be forgiven for concluding that it amounts to a mausoleum of modernity. And those that do dwell in the exile of images are compelled to visit that mausoleum. We stand at its unfinished, abandoned doorway (or maybe it is we who are unfinished and abandoned?) The wind howls and sometimes images seem to blow out into the present. When we are brave we reach in, groping for visions to be read like runes. All images are excessive and enigmatic. That is their essential condition. For reasons both technical and social, photography was responsible for a quantum intensification of this essence. The camera always captured more than anyone wanted, more than anyone could be held responsible for. Of course, it rarely seemed that way. As soon as photography had been invented steps were taken to contain its wildness: the explanatory and reassuring caption, the instructive sequence, the album, the forced laws of genre. But none of these containments hold fast forever. Eventually a photograph works itself loose and even the simplest, most functional document will burst wide open. 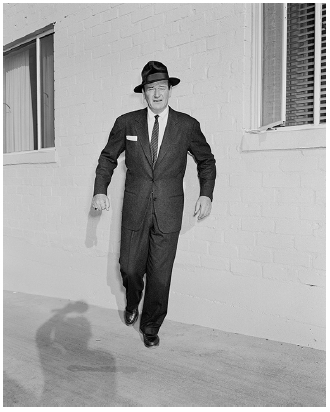 A picture of John Wayne transmutes into a chance encounter or a lucid dream, in which a man becomes an actor becomes a model becomes a two-piece suit becomes an image, only to fall backwards through a hall of mirrors and memory, fragile and vulnerable. Awkward, flesh and blood, uncomfortable with the straitjacket of convention. He’s a misfit and so is the image that transports him. Indeed, while Stanley Wolokau-Wanambwa has redeemed these image-people and given them new life, new light, they all have the endearing demeanor of lost souls. Orphans plucked from obscurity bearing urgent news in languages we can hardly decipher but easily misread. Perhaps even they themselves no longer quite know what it was they wished to communicate. So, let us be careful not to put words in their mouths. Instead, let us see if they put words in ours.